Another PPC network called Oxado. It only serves publishers right now, the advertising option rests with different advertising companies around the world like in U.K. , it currently partners with Yahoo Search Marketing, Miva and Tradedoubler to provide advertisers.So, if you want to advertise through their network you would have to register with its partner websites to advertise on their network. Oxado provides contextual ads on the website.It boasts of high earnings per click, better Click Through Rate , easy implementation of code into the website and ads are quickly provided on the website.Oxado claims to be the best in the business although this would be hard to swallow right now, as far as I am concerned for me and many other publishers Google Adsense has been the best paying PPC company. 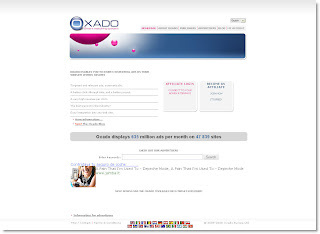 Oxado has a very big advertising network with close to 50,000 websites in it.Oxado provides a lot of ad formats,so you can never be short of options and can choose the format according to your web site's needs.Oxado also provides the option of replacing Google's public service ads by Oxado ads, so your website can make more revenue and that is a plus point from Oxado. The affiliate program from Oxado pays 10% of publishers earning to whom you have referred,so apart from showing their ads on your website,you can also choose to promote your affiliate link and this makes the earning options more and it gives flexibility to the publishers.Oxado also provides a scrolling 125*125 ads which shows many ads and the advertiser's website open in a new window, so the website reader does not deviate away from the website.